I have been given a subscription to the Food Network Magazine for the past two years by my now former employer. I, at one point, was getting 4 different foodie magazines, but my subscription to them all ran out and I have only received Food Network since. No biggie, I LOVE getting a magazine every month. As I told my sister when I got it for her for Christmas–it’s the gift that keeps giving! Anyway, this month’s issue (April 2011), in particular, had some recipes with pictures that will make you salivate, even if you just had a four course meal with dessert. I tried out the first of many tonight–Garlic Shrimp and Chickpeas. We all know my love for chickpeas and their ability to replace popcorn (see here), and I could eat copious amounts of garlic and not care one bit that I smell like an Italian’s armpit. And shrimp is a protein I can have (due to my pescatarianism) that my parents also happen to really enjoy. Woo hoo! I proceeded with caution with this recipe, as most of the dishes I’ve made out of this magazine have been either “meh” or “bleh.” This one was a little better than “meh,” but still could have used some pizazz. Here’s the verdict: Good. Needed lots of fresh lemon juice on top and definitely something else besides salt and garlic and red pepper flakes. Maybe some chili powder or cumin, perhaps just something as simple as season salt. Like I said, good, but was definitely missing an element. Here’s the result, hot out of the oven. Looks pretty good, right? Curious to try it out for yourself? Here’s the recipe. Feel free to tweak as you like! Position a rack in the upper third of the oven and preheat to 450 degrees. Toss the chickpeas with 1 Tbsp. EVOO and 1/2 tsp. salt in a large baking dish, then spread out in a single layer. Bake until golden, about 20 minutes. Meanwhile, toss the shrimp with 4 Tbsp. EVOO, the garlic, lemon zest, red pepper flakes and 1 tsp. salt in a medium bowl. Marinate 10 minutes. 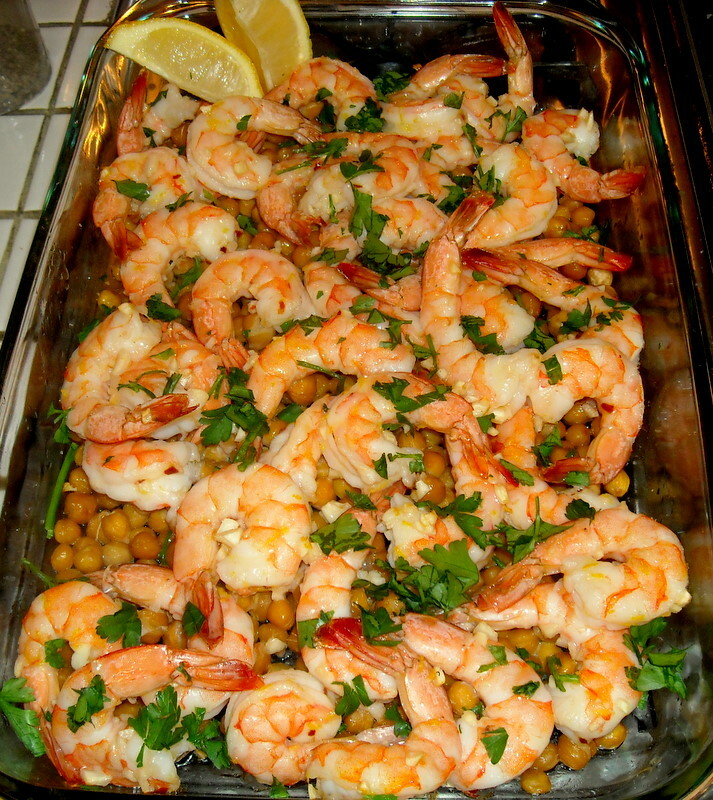 REmove the baking dish from the oven and scatter the shrimp over the chickpeas. Return to the oven and bake until the shrimp are pink, 5 to 8 minutes. Drizzle with the remaining 1 Tbps. EVOO and sprinkle with the parsley. Serve with lemon wedges.